I recently reviewed the new goggles from the Durango, Colorado based company, ICAN Industries. See the video for the full review. At the moment, ICAN goggles are only available in shops throughout New Mexico and southern Colorado, but you can order by phone or email with your credit card. 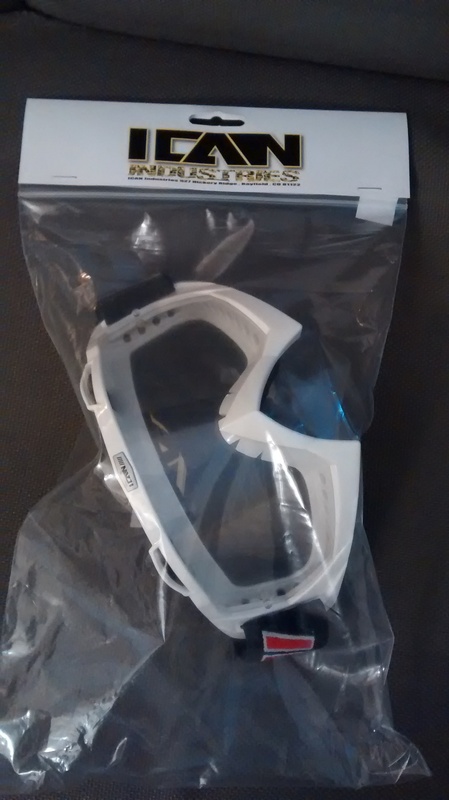 The goggles cost $25.99 and figure $6 for shipping. If you wish to order the tinted lens they are also available for an additional $9.50. The tinted lens is UV400 rated which means it blocks anywhere from 99 to 100 percent of the sun’s harmful radiation. For mail order call or email ICAN Industries at 970-946-9974 or icanapparelusa@gmail.com. Make sure you tell them you heard about their goggles on Spirit Strike! Written by Massimo Lorenzini. Be sure to subscribe to iRide uWatch on YouTube. The new AFX FX-41 is a Dual Sport/Adventure helmet that AFX has added to its line. The FX-41 is not replacing the FX-39, and will be sold as an additional model. The new FX-41 looks aggressive and futuristic with its sharp lines and many vents. I have previously tested an FX-39 and was hopeful AFX had worked out the kinks of the older helmet. The KLIM Dakar Riding Glove is a full feature low cuff enduro and off-road glove that packs a lot of function at a good price point. There are many options for a dual sport rider to choose from, but the LS2 MX453 Dual Sport helmet is designed with adventure riders in mind. This helmet features a dirt bike peak to block the sun and a visor to keep the debris and wind out of your face. A dual sport helmet may be the perfect balance between functionality and comfort. The Fox Polarpaw glove is an affordable glove that offers good protection, but perhaps it was not named properly. If you are looking for a cold weather glove I would not suggest these gloves, but if you want a glove to transition from mesh gloves to cold weather gloves the Polarpaw will fill that gap. They are reasonably priced at $39.99 so adding these gloves to your arsenal won’t break the bank. The Arai XD4 is a premium dual sport helmet. As with any Arai helmet, you expect the protection and features to be top shelf and the Arai XD4 does not disappoint. For my readers that ride you know what ATGATT stands for, but for my readers that have not yet discovered the staggering awesomeness of motorcycling, I will explain. ATGATT is an acronym that stands for “All The Gear All The Time”. I am not sure of the origins of this acronym, but if I had to take a guess I would say the MSF (Motorcycle Safety Foundation) came up with it. They use it as a mantra during class to encourage riders to always wear proper protective gear while riding. The whole subject of ATGATT can get touchy with some people. Personally, I am a believer, and always practice ATGATT. However, I am also a big believer in personal freedom and will always support the right to make your own choice.